The Restaurant Set Portes, or the 7 Doors Restaurant, is a Spanish restaurant in Barcelona which specialises in producing traditional yet innovative cuisine based on recipes from the Spanish region of Catalonia. 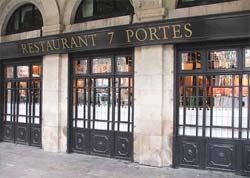 The Restaurant Set Portes has a history which dates back to the middle of the 19th Century. It was during this time that the building that houses this Spanish restaurant was built. The building that houses the Restaurant Set Portes is part of the Casas de Xifré which are named after the man who had them built, Josep Xifré i Cases. Josep Xifré i Cases was the richest man in Barcelona at the time and was also the inspiration for some of the houses built in the squares of Paris. When the Casas de Xifré were built, Josep Xifré i Cases moved his home and offices there. However he left a section of the ground floor free to be used as a café. This establishment had 7 doors which opened to let the customers in, and an eighth door for deliveries and staff. The cafe was first opened by Josep Cuyàs in 1836 who named the café after the 7 doors. Over the years, the restaurant has changed hands many times. It even became a café cantante at night, where Flamenco dances were performed to paying customers. In 1929, the restaurant came to be more focused on gastronomy, changing its name from the 7 Doors Cafe to the 7 Doors Restaurant. The restaurant soon became one of the places to go for the upper Spanish classes in Spain, including writers, politicians and journalists. However after the renovation works the owners of the restaurant were tired and decided to shut the restaurant in the 1940s. Upset with its disappearance, a group of the restaurant's faithful clients decided to reopen the restaurant in 1942. 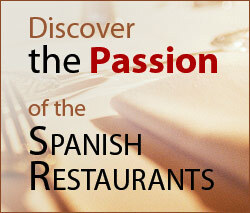 Since then, the Restaurant Set Portes has been a reference point of both Spanish history and Spanish food. Today it is run by the Parellada family, an historic family who has been in the hospitality and restaurant industry for over 300 years. The restaurant still resembles its former self, with the 7 magnificent, arch-shaped doors at the front of the restaurant, the dark wood cladding and the iron columns. Around the edge of the dining rooms there are a number of brass plaques which contain the names of some of the restaurant's most famous visitors, such as the film director Pedro Almodóvar, the playwright Frederico García Lorca and the Spanish King, Juan Carlos I. You never know who you might bump into during a meal at this restaurant when you visit Barcelona! 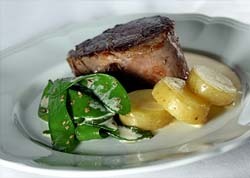 The cuisine at the Restaurant Set Portes is based on Catalan and Mediterranean recipes. They ensure that all of their ingredients are fresh, natural and in season in order to produce the best quality dishes that has made them so famous. The ingredients are cooked slowly over a low flame to retain as much of their original flavour as possible and are always seasoned to enhance the taste even further; whether that be with wine, almonds, laurel or lemon. Some of the restaurant's suggested seasonal meals include 'Civet de jabali' (Wild Boar stew), 'Rabo de Buey' (Oxtail), and 'Calamares rellenos de pescado y marisco' (Squid rings stuffed with fish and seafood). Aside from these dishes, the Restaurant Set Portes also make a range of paellas to suit every palate. Furthermore, for all those with a sweet-tooth, you will be pleased to know that the Seven Doors Restaurant has an extensive dessert menu which includes delights such as 'sorbet de limón hecho de la casa' (Home made lemon sorbet), 'trufas de chocolate 7 portes' (7 Doors Chocolate truffles), and the traditional Spanish dessert 'Flan con nata' (Flan with cream).